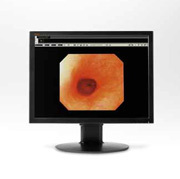 With a slim and sleek design, our clinical display series is ideally designed for PACS review, Laboratory, Endoscopy, Post-operative care, Private Practice, Modality Image Viewing or PACS Work list Display with DICOM 3.14 compliance. 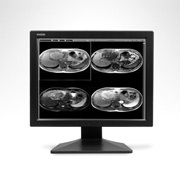 Outperforming their commercial counterparts, these LCD displays have higher brightness levels, better contrast ratio, backlight sensors for stable luminance control, and meet all DICOM 3.14 standards. WIDE’s Modality line of displays with High Advanced Video Image Processing features motion adaptive deinterlacing, dynamic edge enhancement, spatial noise reduction, and low-angle/jaggy-free images during 'Real-Time' procedures. These displays are the perfect fit for new installations but also provide the flexibility required to replace most existing review or modality CRT monitors and accepts analog, DVI, S-Video, composite, and BNC (SOG). Conventional TFT LCD display shows non-uniform display and color changes when looked at from an angle because TFT LCD does not cover wide viewing angle. 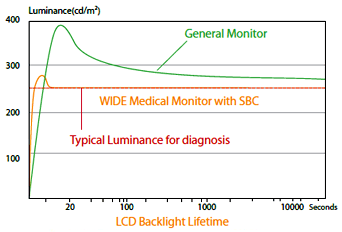 As a result conventional LCD display is not appropriate to use for medical imaging workflow. 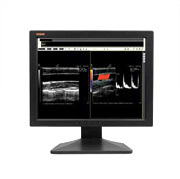 CL20 and CL24 express very constant image display thanks to superior IPS TFT LCD technology. On-board backlight stabilization sensor called SBC ensures the brightness change of the backlight and automatically manages the brightness of the LCD backlight to maintain the best consistency of image quality. To ensure the most accurate and consistent tone of expression, the CL series is calibrated and managed with high professional production and quality process. It sets very precise grayscale tones to meet a compliant with DICOM Part14. 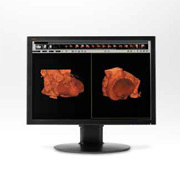 On-board 10-bits Look-Up Table turns the display into an accuracy and precise for displaying imaging images. The WIDE displays have various pre-calibrated viewing modes including DICOM-Blue, DICOM-White, sRGB, Text View and User mode. These viewing-modes are easily selectable with the button on the front control center. The User mode also can be uploaded with its preference display configurations using bundled calibration software by the end-user or technician. The CL20 equips DVI and VGA connectors, but CL24 has very various video connectivity for its broad range of use such as DVI, DisplayPort, HDMI, Component. 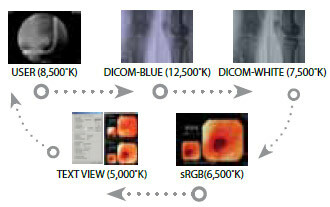 It gives more flexibility to use the CL series into the medical imaging including modality application. One USB Up-stream and Two USB Down-stream allow its wide range of connectivity with modality equipment and external sensor for monitor calibration. CL series is able to be calibrated using the WIDE’s external sensor called i1 display 2 and the bundled calibration software program sold separately. It offers medical grade compliant with the DICOM Part 14 standard. CL series has been designed and architected following through the guideline of the medical grade. CL series complies with global medical safety and regulation standards such as FCC Class B, CE, VCCI, KC, UL, CSA etc.) Landscape Portrait. Seven different languages based on-screen-display menu allows very ease of use the display and convenient setting of the display in own native language (English, Spanish, French, Dutch, Italian, Russian, Japanese). CL24 equips for multiple windowing functions for picturein-picture (PIP) and pictureby-picture (PBP) based on its multiple connectivity of input sources. For instance it displays image from PC signal came in through DVI or DisplayPort in the left half screen window and video image came in through composite input in the right half screen window same time.